An easy recipe for a healthy oatmeal cookie skillet that will be ready and on your table in less than thirty minutes. 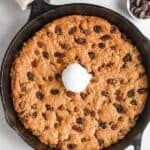 Desserts that can be eaten out of a skillet, are easy to make, and are healthy make the perfect sweet treat! In a large bowl, mix together flour, baking soda, and salt. In a small bowl, whisk egg, coconut sugar, coconut oil, and vanilla. Add wet ingredients to dry and stir till combined. Pour into greased skillet and bake for 18-20 minutes or until toothpick comes out of center clean. Enjoy! Store covered on counter for up to 5 days.